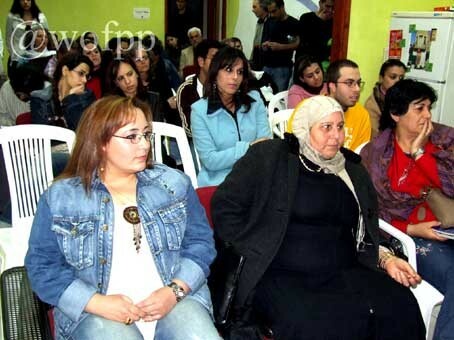 All the Palestinian women political prisoners have been transferred from HaSharon Prison to Damon Prison. The transfer began on October 31 and was completed on November 7, 2018. For years women political prisoners have consistently demanded that they all be moved to the same prison and therefore they are pleased that this has been done. The Israel Prison Service (IPS) gave no reasons for the transfer. However, it appears to be related to an Israeli High Court of Justice ruling in June 2017, which ordered the state to increase the cell space per prisoner, which in many cases is a mere 2.2 square meters (sqm), to 3 sqm for the entire prisoner population within 9 months, and to 4 sqm within 18 months. In HaSharon Prison the Palestinian women prisoners had cell space of much less than 3 sqm per person. The state failed to comply and instead requested the High Court grant a ten-year extension, until 2027. The organizations* that had filed the petition to the High Court in 2014, stated in 2018: “The state continues to disregard prisoners’ rights and intends to arbitrarily ignore the ruling of the High Court.” On November 1, 2018, the court granted an extension until April 30, 2019 for cell space of 3 sqm, and until May 2, 2020 for a cell space of 4 sqm. It should be noted that in order to comply with the High Court of Justice ruling to reduce overcrowding in jails, the Knesset (the Israeli parliament) passed an amendment to an existing law on November 5, 2018. The amendment considerably extends the possibilities of “administrative release” of prisoners. However, the Knesset arbitrarily excluded Palestinian political prisoners from this extended early release for administrative reasons. The Palestinian women political prisoners who had expected the new law to facilitate their early release had their hopes dashed. Following the transfer of all the Palestinian women political prisoners from HaSharon Prison, there are currently about 50 women prisoners altogether in Damon Prison. The fluctuation in number is due to new arrests as well as releases at the end of prison terms. The first struggle the Palestinian prisoners launched was against the arbitrary decisions by the prison authorities regarding cell mates. The political prisoners demanded to choose their cell mates by themselves. In protest, the prisoners refused to go into the cells and stayed in the yard. They entered negotiations with the prison authorities and subsequently the prisoners were granted the right to decide who shares cells with whom. The Palestinian women prisoners are incarcerated in a wing with 13 cells. In each cell there are about 4–8 prisoners. One of the rooms is the isolation cell and another is an isolation cell with cameras. There is a large cell that is currently closed; the women prisoners were told that only the minors would be allowed to use it to study, which is worrying, as they had earlier been told it would be a library and a reading room for all the prisoners. Each prisoner’s family is only permitted to bring 2 books per month – and that on condition that the prisoner has in advance obtained permission to receive the books and that she returns to her family the 2 books she already has. All the cells and the yard have a concrete floor, without any tiles or other floor covering. There are no chairs in the cells and the prisoners often sit on the bare floor, as the prison authorities prohibit the prisoners from covering the floor with blankets. Each cell is equipped with an electric water kettle, an electric cooking plate, and a TV set. There is a toilette in each cell, but no shower. The prisoners are daily locked in their cells for 20 hours and sometimes all day. The prisoners are not even allowed to run in the yard. Moreover, they are constantly under surveillance by 2 cameras, which inhibits the prisoners from doing most exercises, since they are watched by male guards. The prisoners have no freedom of assembly. In fact, they are prohibited from gathering in the yard. The prisoners get about 4 hours in the yard, which includes the only opportunity they have to take a shower. The yard is not covered by a roof; so the prisoners do not leave their cells when it is raining. There are only showers outside the cells; thus the prisoners can only have a wash during the limited time they are permitted to leave their cells and go to the yard. Their access to the showers is further curtailed every time they are not allowed out of their cells, such as during visits by the prison management. Having the showers outside the cells makes it particularly hazardous in the winter, as Damon Prison is on Mount Carmel, where it gets very windy and cold. The prisoners are prohibited from possessing educational material. Recently, during a cell search, a single page containing educational material was found and confiscated. The prison guards told the prisoners that no educational material is allowed. The prison still does not permit families of prisoners to supply materials for handcraft and artwork. Therefore, the prisoners are essentially deprived from their right to engage in creating handcraft and artwork. Two of the Palestinian women political prisoners are currently detained under administrative detention, which is a mechanism the Israeli authorities use in order to incarcerate people without charge. The prisoners are held for extended periods of time on grounds of claimed “information” that is never disclosed to the prisoners or their legal teams. Administrative detention is used almost exclusively to detain Palestinians. Though an administrative detention order is for up to six months, it can be extended an indefinite number of times. This torturous detention deprives the prisoners not only from challenging the withheld secret “information” against them, but even leaves them in the dark regarding the length of the detention. They don’t know when they will be released, not even after how many years. Indeed, one of the administrative detainees has already had her detention extended a number of times. Khalida Jarrar, Palestinian Legislative Council (PLC) member, 55 years old, mother of two from Ramallah, was arrested on July 2, 2017. 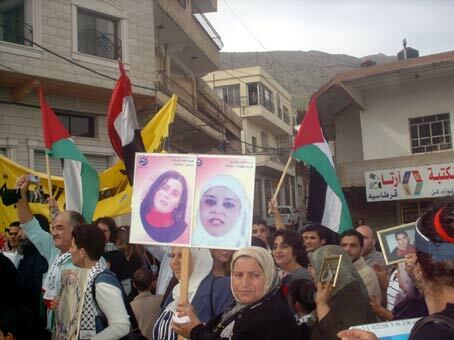 The military commander initially issued a 6-month administrative detention order against her. In December 2017 the administrative detention of Khalida was extended by another 6 months and afterwards, in June 2018, by another 4 months. Then in October 2018 by another 4 months. Khalida had been released from prison in June 2016, after 14 months, including one month under administrative detention. Fida Daa'ms, 24 years old, from Beit Ummar, Hebron district, is a student. She was arrested on May 29, 2018 and sentenced to three months imprisonment. Just when she was due to be released, the military commander issued a 6-month administrative detention order against her, on August 16, 2018. Fida had been released from prison in July 2015 after six months of imprisonment..
We wish to join the call to release all political prisoners.